You know when parents talk about sneaking vegetables into their kids food? None of us really believe that it works, right? Vegetable strips are not “french fries,” shredded vegetable patties aren’t “burgers,” and raisins may be sweet, but nature’s candy is a bridge too far. Zucchini, however, is a different animal altogether. Put it in cookies, pancakes, bread and pizza, and I’ll gladly be fooled any day of the week. It was my Mom’s recipe for zucchini pizza – where shredded zucchini mixed with a little cheese, flour and egg forms the crust – that inspired me. 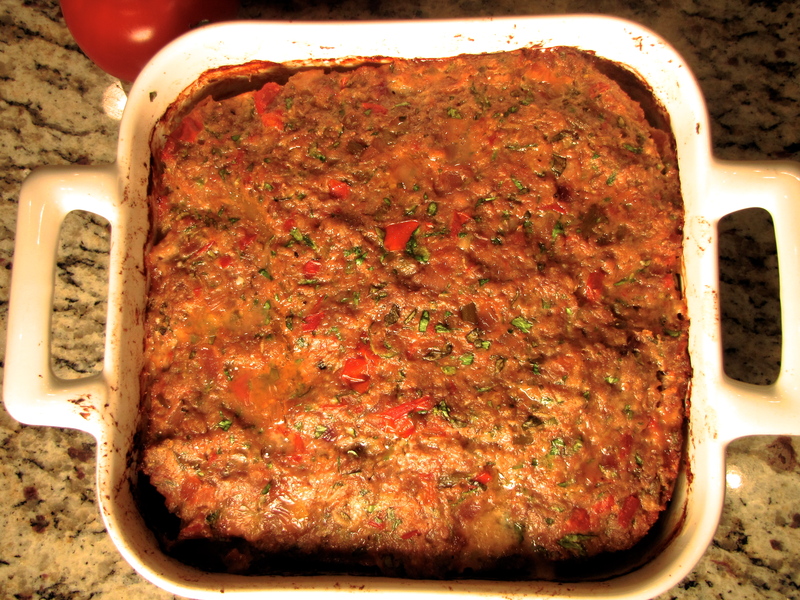 This meatloaf does everything that “sneaking-in-veggies” recipes are supposed to. It turns a pound of ground beef into eight, hearty servings, each of which has almost half a cup of zucchini. Replacing the usual tomato paste with a homemade tomato jam sneaks half a tomato in there t0o, along with an amazing amount of flavor. All these veggies lighten the meat loaf so it feels summery, not dense and wintry. *Pancetta is salt cured, not smoked. If you use bacon you can simmer it for a couple minutes first to remove some of the smoky flavor. **Another magic vinegar from Sapore. If you need a substitute, use a nice, acidic Sherry vinegar. Make the tomato jam. : Over medium heat sauté pancetta in one tbs olive oil until crisp. Remove with a slotted spoon and reserve. Add onion. Cook until soft. Add garlic. Cook 1 min until fragrant. Add tomato and cook until thick and jammy. Add a little water when pan gets dry. Deglaze pan with vinegar. Season to taste with salt and pepper. Mix the warm jam with the rest of the ingredients, reserved pancetta and salt and pepper. Fry a small patty of the mixture then season to taste adding additional salt, pepper, cheese or vinegar as needed. Press into a 9” square baking dish or form into a loaf on a baking pan. Bake at 325 for about an hour. Let rest 10 minutes tented with foil and serve. Tony, this is for you. No, not for my cousin, Tony, who nearly demanded a standing ovation when he first added lettuce to his tacos (today he has a highly sophisticated palate). This for the Tony who came to dinner two years ago and warily picked up a stuffed, fried zucchini blossom. “It’s a what? !” you asked. “A zucchini flower,” I replied. I think I noticed you scoping out the exits, but you bravely took a bite. I think you enjoyed it. And how could you not? Zucchini blossoms taste mildly and sweetly of zucchini. 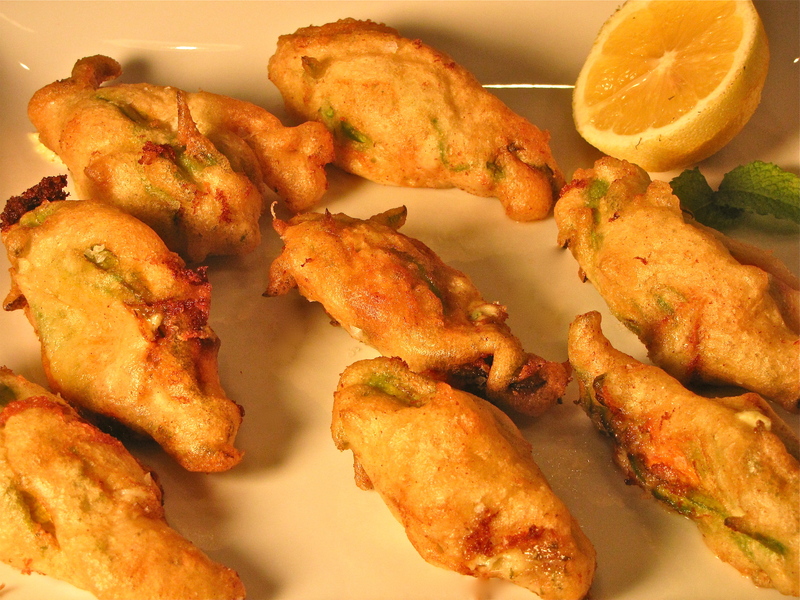 Stuffed with a mild goat cheese, fresh herbs, salt and pepper, they are beer battered and fried. 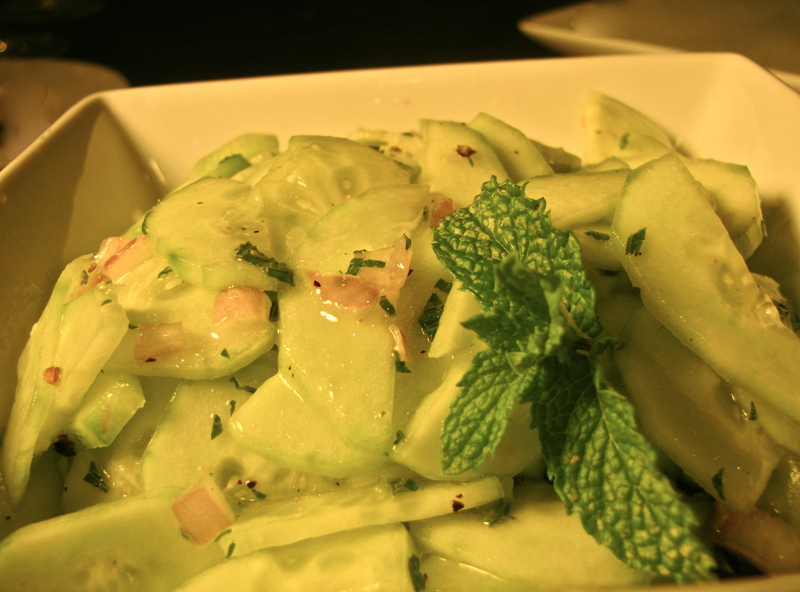 Think of it as a zucchini popper! This is Italian bar food, crisp and sprinkled with sharp flakes of sea salt. 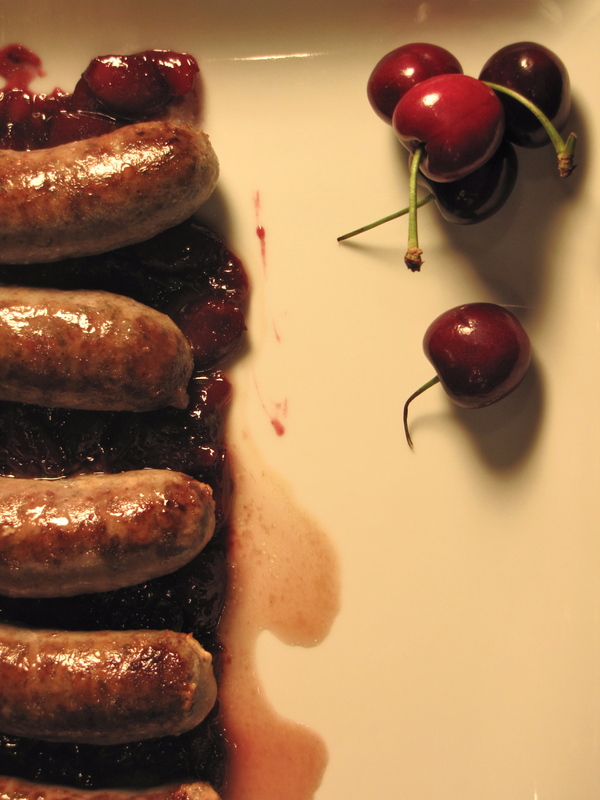 An indulgence to be sure, but pure gastronomic pleasure! For those of you worried about a lost generation of zucchini, pinched off the vine at the start of their lives, sleep soundly. We only harvest the male flowers. The female ones go onto produce beautiful summer squashes. We’ll slice, bread and fry those later. The best way to remove food from hot fat is with a spider. Seriously, go into a cooking store and ask for one. They won’t laugh at you. If they do, tell them that your big brother is going to beat them up. Then give me a call. *Look for cooking grade olive oil in the grocery store. I wouldn’t touch it for sautéing, but it’s perfect, and cheaper, for deep frying. Heat 2″ oil to 350 degrees in a 6 qt pot. 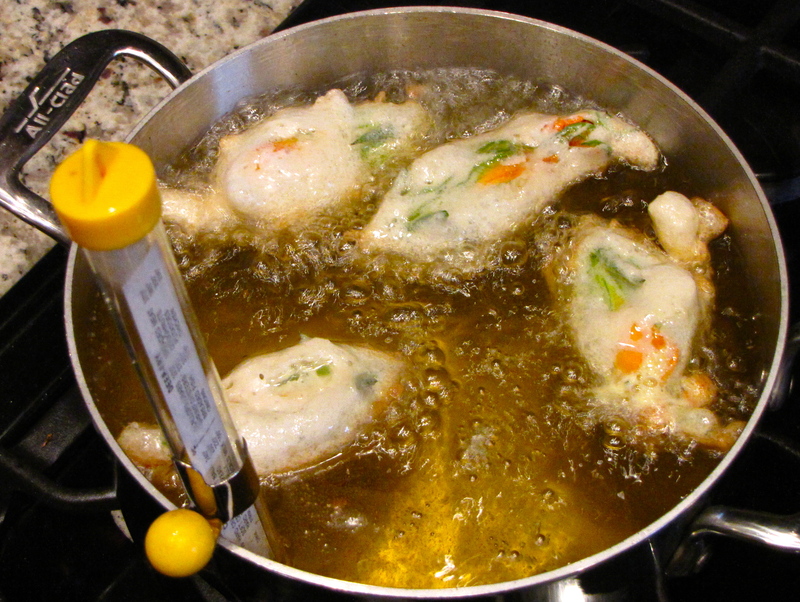 Check temperature with a deep frying or candy thermometer. Mix together goat cheese and enough cream to make it pipeable from a pastry bag. Stir in fresh herbs. Season to taste with salt and pepper. Whisk egg whites until they form soft peaks. Add a pinch of cream of tartar, is needed, to get them started. 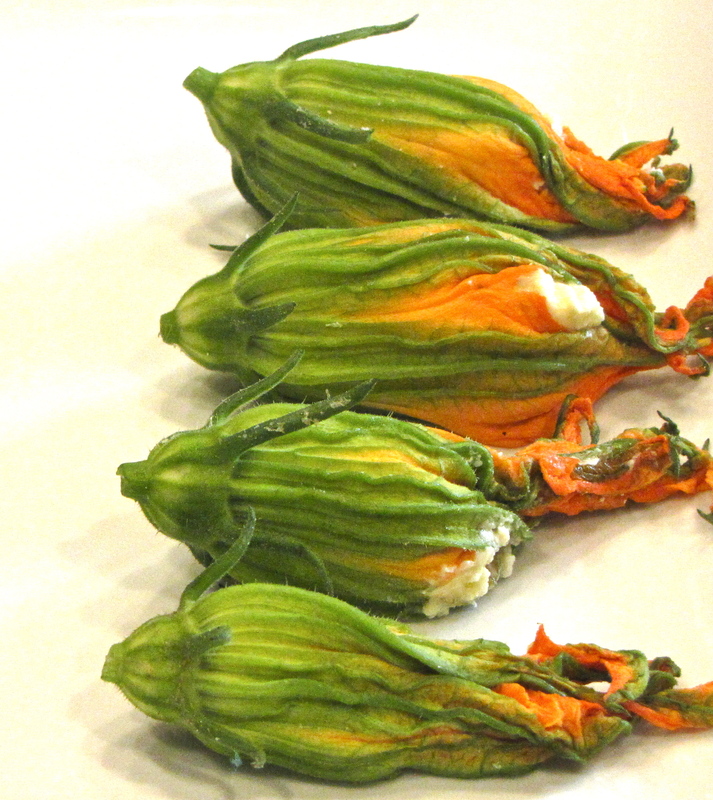 Using a pastry bag or ziplock bag with a corner cut off, pipe the cheese into the zucchini blossoms. Gently twist the filled flowers closed at the top. This will be immensely frustrating the first time. Forgive your inexperience, drink the rest of the opened beer, and keep going. Mix flour and salt together in a large bowl. Whisk in beer just until smooth. Don’t overwork. Gently fold eggwhites into batter. Roll a few flowers in the batter and gently shake off excess. Place them in the hot oil, being sure not to overcrowd. Cook them until golden, flipping once. Be careful not to burn. 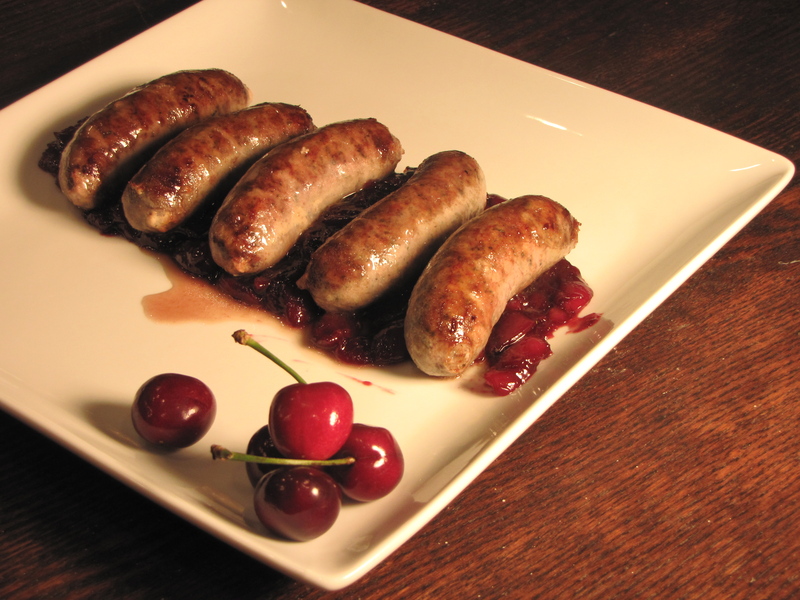 Remove them to a plate lined with paper towels and sprinkle with sea salt. Return the oil to 350 and fry the remaining flowers in batches. Eat them while nice and hot. Drink lots of chilled Prosecco. Or rosé. Discuss how fabulous and blessed your life is. I feel like I should be sitting in a confessional, leaning in close, talking directly to the camera. “I didn’t used to like tomatoes,” I would say in a hushed tone. “For years I thought raw tomatoes were gross!” Perhaps this revelation is so shocking that I should ask to be silhouetted with my voice modulated. It’s true. As a child I hated raw tomatoes. I loved Brussels Sprouts, broccoli, cabbage and cauliflower. Give me artichokes and onions, just about anything Mom put on the dinner table, but I grimaced each year when she asked me to try one bite of a ripe tomato, fresh picked as we stood in her garden. Nine years ago that started to change and today I love raw tomatoes. I chalk it up to a wiser palate. This past week I decided to venerate the first of this summer’s tomatoes, picked fresh under the hot sun. 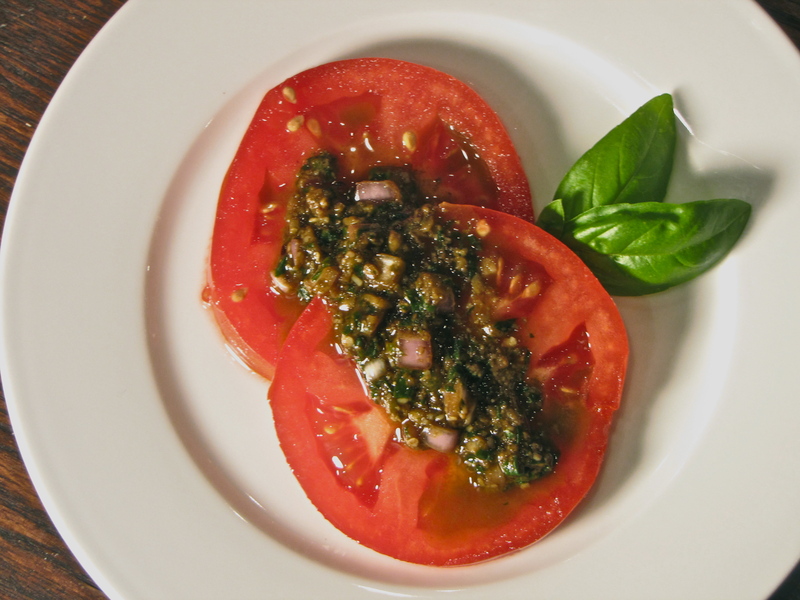 Two thick slices of beefsteak-type tomatoes didn’t need anything more than salt and pepper, but I went ahead and added a simple balsamic vinaigrette made with fresh basil and garlic scape pesto, fragrant from pounding in the mortar. I fell in love with tomatoes all over again. Then I called my Mom. Using mortar and pestle, pound garlic or scapes with 1/2 tsp coarse sea salt. Then pound in basil, followed by pine nuts, cheese and oil. Season to taste with pepper and additional salt. Make dressing: whisk together shallot, pesto and vinegar. Whisk in oil in a thin stream. You may not need all the oil. Start with 1/2 cup and taste as you go. Season to taste with salt and pepper if needed. 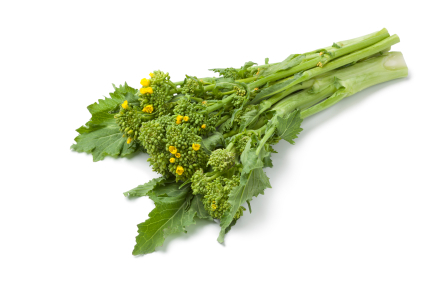 Taste the dressing with a piece of tomato and correct the balance of oil , vinegar and pesto as needed. Serve over thick slices of the freshest tomatoes you can find! 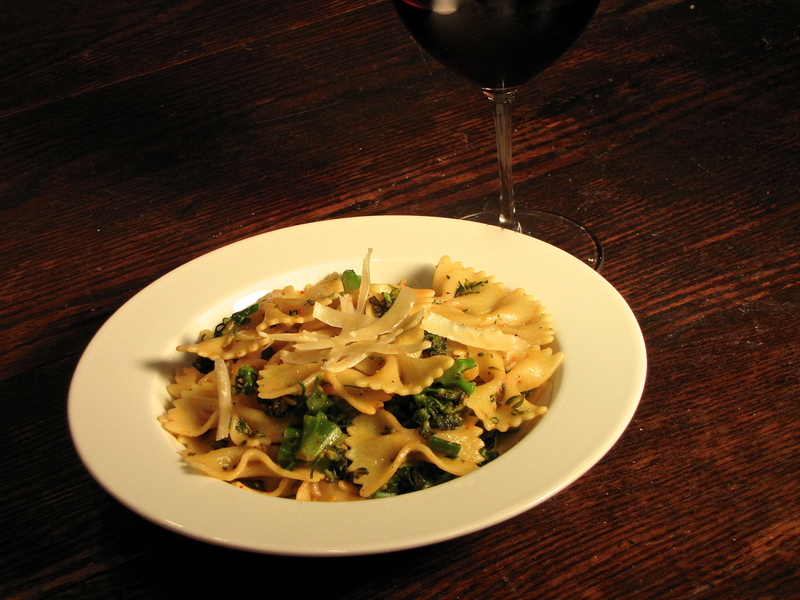 Top with ribbons of fresh basil. Anything this orange, made with root vegetables, should be served on a crisp fall day – rich and hearty with a crusty bread and some good farm-fresh butter (which I evangelize about here). But this carrot-beet soup is light and fresh, tastes as good cold as it does served hot and is perfect for summer. Arriving home from a trip to the Market with baby carrots and golden beets, I began searching cookbooks for salads and sautés. 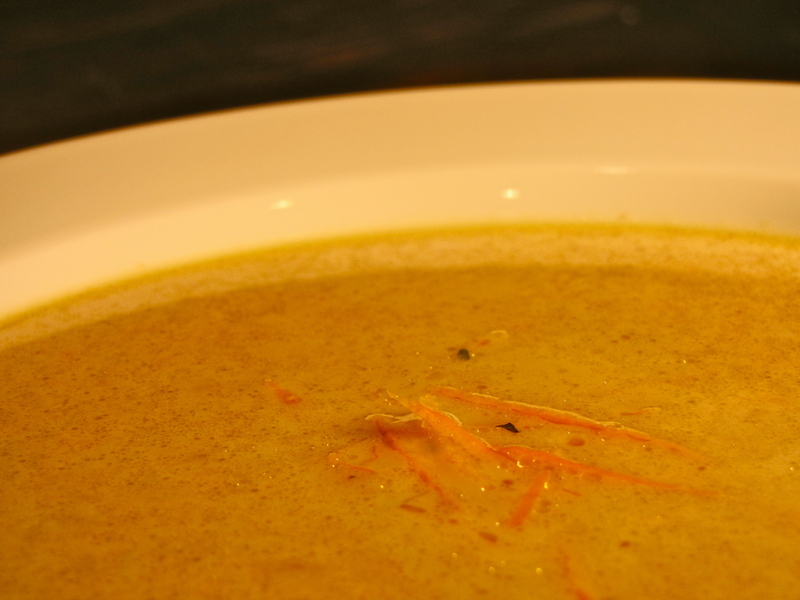 Stumbling across a recipe for Potage Crécy first made me think of soup. Crécy, it turns out, is not French for orange root vegetables, but refers to a town known, once-upon-a-time, for growing exceptional carrots. However, there is debate about which of two French towns, one in the south and one in the north, each with Crécy in its name, first served up this light summer soup. 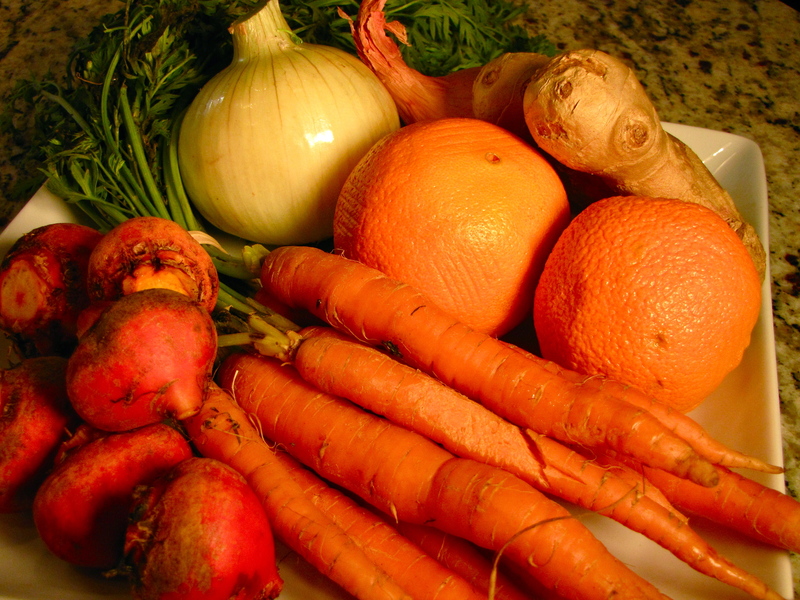 Reading through several recipes, I discovered a basic formula of carrots cooked with onions and stock, puréed and flavored with orange. We added the golden beets, sweet but far less earthy than red ones. I grabbed a bottle of Sapore’s Orange Oil off the shelf and we served up three bowls, each seasoned differently. It was a quick bite after adding turmeric but before adding cumin that was our favorite – although curry was a close second. Served warm, it is light and sweet. Once chilled it is herbal and far more carrot-y. Both are delicious. Add carrots and beets. Sauté 7-10 minutes until golden on edges. Add ginger after 5 minutes. Add stock and simmer approximately 30 minutes until vegetables can be mashed with a fork. Pass soup through the finest blade of a food mill or purée with a blender. Return to pot. Stir in Orange Oil and simmer an additional 5 minutes to bring flavors together. Remove from heat, let cool slightly, and stir through cream. Add turmeric a little at a time so as to not overpower the carrot flavor. Season to taste with salt, pepper and sherry vinegar.